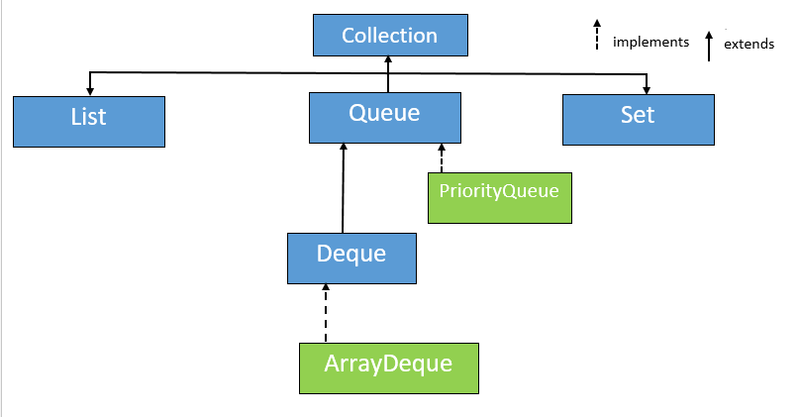 Queue in Java is an interface which is present in java.util package. It extends the collection interface. A Queue is an ordered list in which elements insertions are done at one end(rear) and deletions are done at the other end(front). The Queue interface basically orders the elements in FIFO(first in, first out) manner. A railway reservation counter is our daily life example of Queue, where the people stands outside the reservation counter. The person who comes in the last is standing in the last of the line and the person who gets the ticket is removed from the beginning of the Queue. Points to remember about Queue Interface. 1. Child interface of collection interface. 2. Null values are not allowed. 3. Duplicates values are not allowed. 4. Heterogeneous elements are allowed. 5. Based on the FIFO manner. 6. LinkedList and PriorityQueue are two implementation class of Queue interface. 7. We cannot instantiate it because it is an interface, rather than we create the instance of LinkedList or PriorityQueue. 1. boolean add(Object): This method is used to insert the specified element at the end of the queue. It returns true if the element is successfully inserted. It throws an exception if no space is currently available in the queue. 2. Object remove(): This method is used to remove the element at the head of the Queue and returns its value. It throws NoSuchElementException if the queue is empty. 3. Object peek(): This method returns the element at the head of the queue without removing the element. It returns null if the queue is empty. 4. Object poll(): This method is similar to remove() method but the only difference is it returns null if the Queue is empty. 5. Object element(): This method returns the element at the head of the queue, the element is not removed. It throws NoSuchElementException if the queue is empty. Read: What is the exception in Java and how to handle it? 6. boolean offer(Object obj): This method is used to insert the specified element into this queue. It returns true if the element is successfully inserted otherwise it returns false. How to implement Vector class in Java? How to implement a tree data structure in Java?